Detoxing was in vogue a few year ago, but now it’s kind of lost its steam as body positivity has come more into the light. 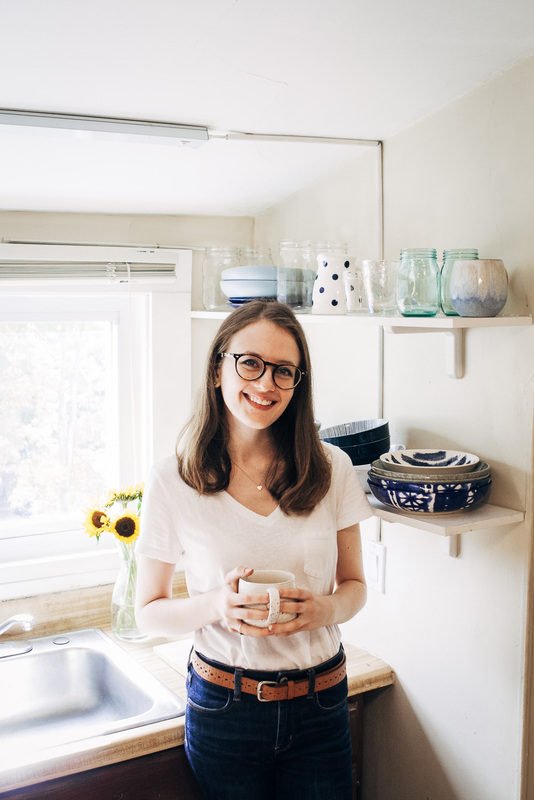 Which I want to address – you can be body positive AND want to eat healthier. One does not preclude the other. And I am all for body positivity AND eating healthy. But it’s important to mention that TRUE detoxing happens in the body already – your body actually has a very efficient system for removing toxins. A juice cleanse is not a real detox. 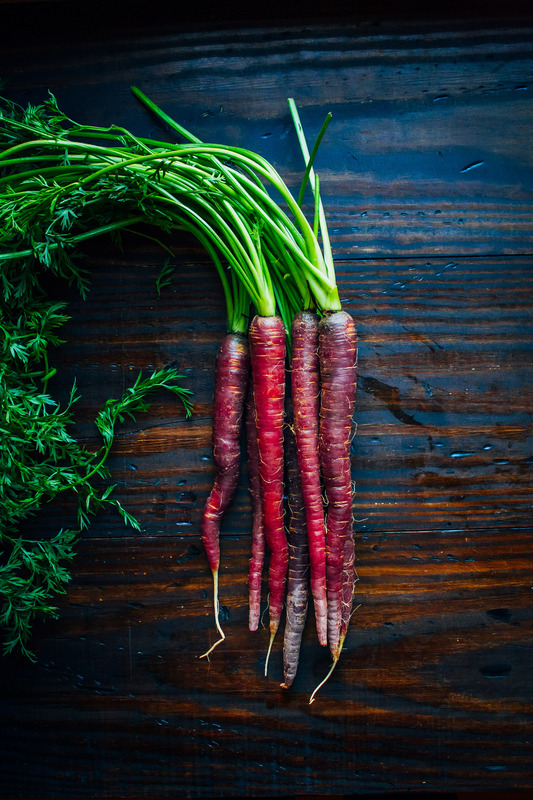 However, we CAN make it easier for our bodies by eating the nutrients it needs for these detoxifying processes to happen – i.e. foods that aid in digestion and elimination, foods that promote liver health, etc. But let me stress again that the foods are NOT the detox themselves – they’re just helping the body do what it already does. 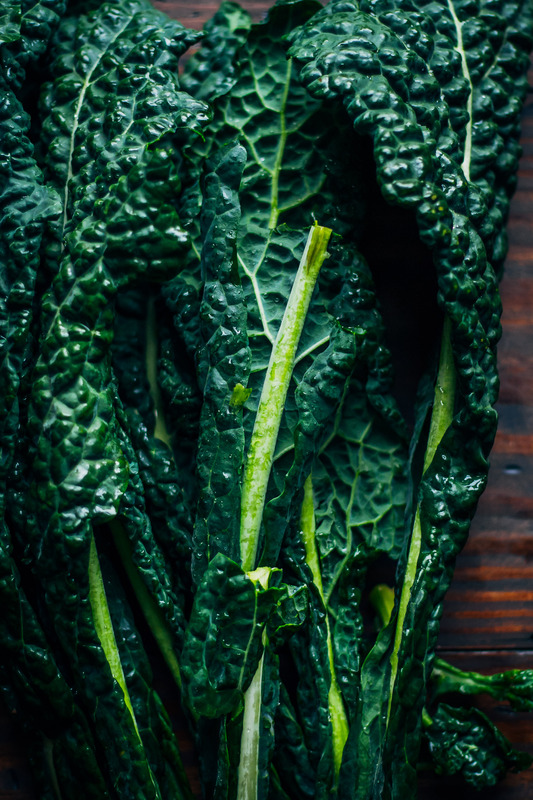 Enter this kale detox salad. The overarching principle behind this salad being a “detox” salad is that it’s super green, which means chlorophyll. I love talking about chlorophyll as a detoxifying agent because it’s one of the best things you can have for your liver. Without getting too science-y, chlorophyll helps increase the activity of Phase II Biotransformation Enzymes, which have been shown to help remove toxins and carcinogens from the body. So basically, eat green and help your liver. But I had to make this salad delicious, because what’s the point of eating it if it’s not delicious?! 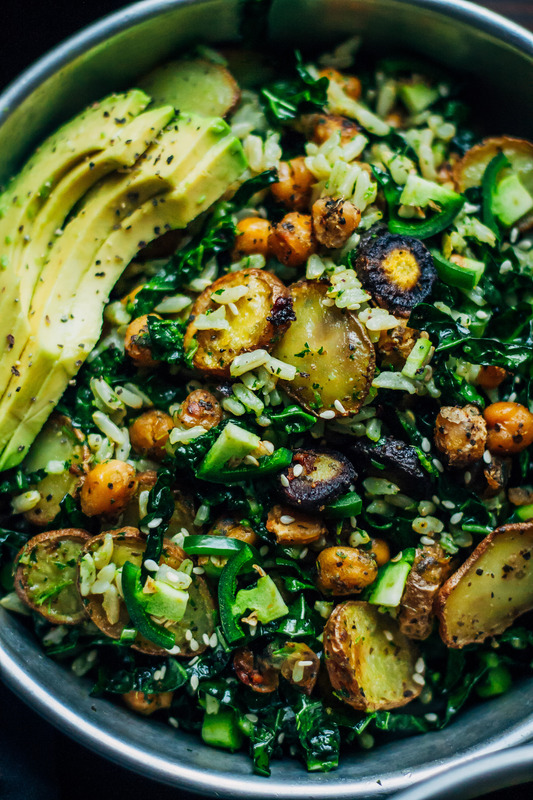 It’s got roasted potatoes and carrots, brown rice for fiber, chickpeas (of course), and lacinato kale – all topped with a deliciously chloro-filled (see what I did there!?) green pesto. It’s delicious, AND good for your bod! I hope you all love it! 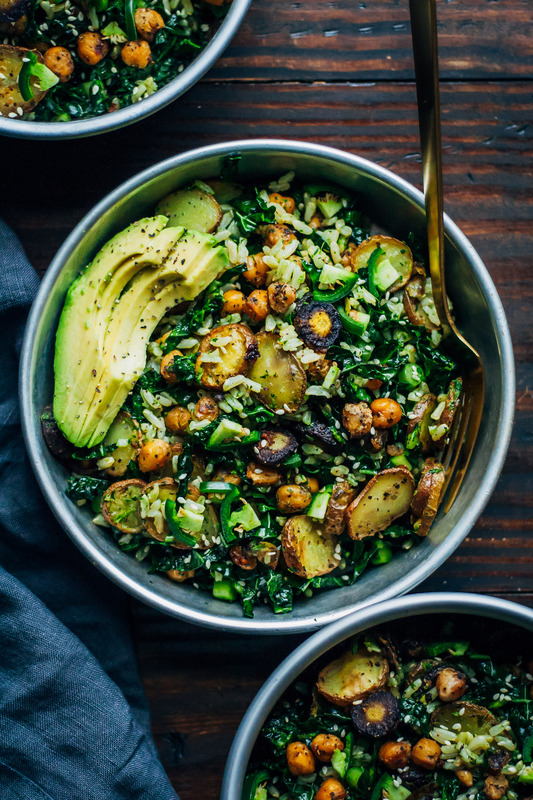 This kale detox salad is the perfect meal for a cleanse, made with whole, real ingredients. Made with a mouthwatering carrot top pesto and roasted vegetables. Prep vegetables - wash and dry carrots and potatoes. Cut both into rounds (disks), about 1/4 inch thick. In a bowl, combine chopped potatoes, carrots, and chickpeas. Add in olive oil and spices, and mix well until everything is evenly coated. 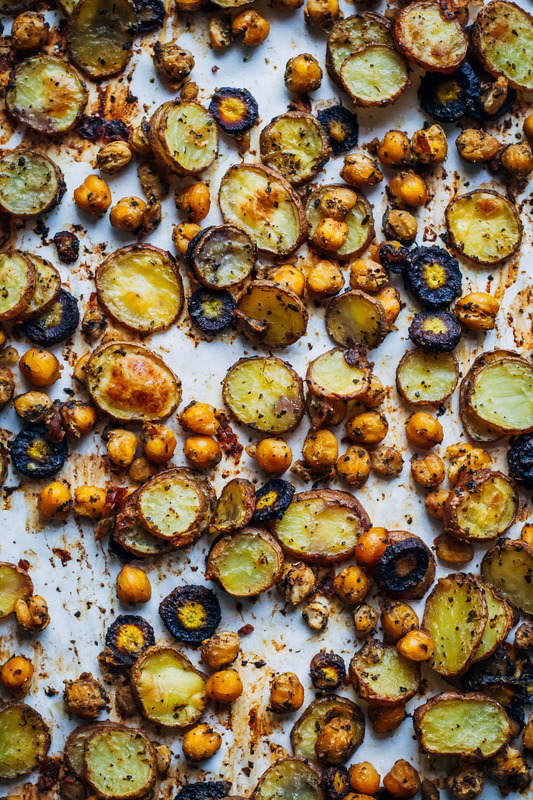 On a baking sheet lined with parchment paper, bake vegetables + chickpeas for 45-50 minutes. When they're done cooking, remove from oven and let cool. While vegetables are cooking, make pesto - combine all ingredients into a food processor and process on high until a slightly smooth pesto is formed. In a bowl, mix thinly sliced lacinato kale and pesto until kale is evenly covered. Then, add in roasted vegetables + chickpeas and brown rice. Mix well until everything is evenly combined. Serve in bowls and top with sesame seeds. If you can't find lacinato (Tuscan) kale, any other hardy green will do - like chard, regular kale, or collard greens. Also, for this recipe I use my Cuisinart Food Processor (affiliate link). This food processor is great and I use it in my kitchen multiple times a week. I highly recommend it! I love incorporating chickpeas and grains into salads, it makes them so much better!! :D Thanks Abby!! So true what you said about detoxing! It can be just because you want to eat healthy not because you want to make up for a bunch of bad decisions. This salad has got to be the sexiest detox I’ve ever seen. Those crispy potatoes and that carrot top pesto are making me drool! Wow wowoww. Heck yes on the chickpeas and potatoes for extra heartiness. I need to try carrot top pesto….my problem is I like the way they taste plain (well, blanched a little) that I just want to eat them like that. I never have the patience to turn them into pesto, even though I know it would be amazing. If you like them plain then you’d definitely like the pesto!! You should try it!! I definitely wish I could reach through the screen for this one omg. I’ve never heard of pesto made with carrot tops, heck I’ve never even put those in a salad! Definitely need to break my habit of eating the same salad every day and try this! SARAH! This is so beautiful!! I adore crispy chickpeas! Sarah, this salad is absolutely beautiful !!! I have a complicated relationship with the terms “cleanse” and “detox”. I am totally on board for people eating healthy foods and doing what is best for their bodies, but sometimes I feel like the concept of a cleanse is another way to tell women that their bodies are somehow dirty or wrong and need to be altered. Not even in a weight loss sense, but merely the words used seem to express another thing women need to change about their bodies and it makes me uncomfortable. Especially the contrasting words of “cleanse” and “dirt”, ya know? Aww thanks for your note about my photography, Ashley!! I’ve been working really hard on it so it’s nice to be noticed. :) :) And I’ll definitely be posting more about my nutrition classes!! Yay for chlorophyll! And thank you for clearing up this whole detox myth… I think the trend has gotten way out of control. For so long, when I was much younger, I thought detox was a destination. Something you did once or twice a year by staying on juice, nothing but salads for a week or getting a meal from a corporation by way of a powder, in a carton or box. But, I’ve learned overtime, it’s a way of life… a way of eating whole foods and making sure they are mostly plants (some would agree only plants). The labels always get me because they can be misinterpreted. 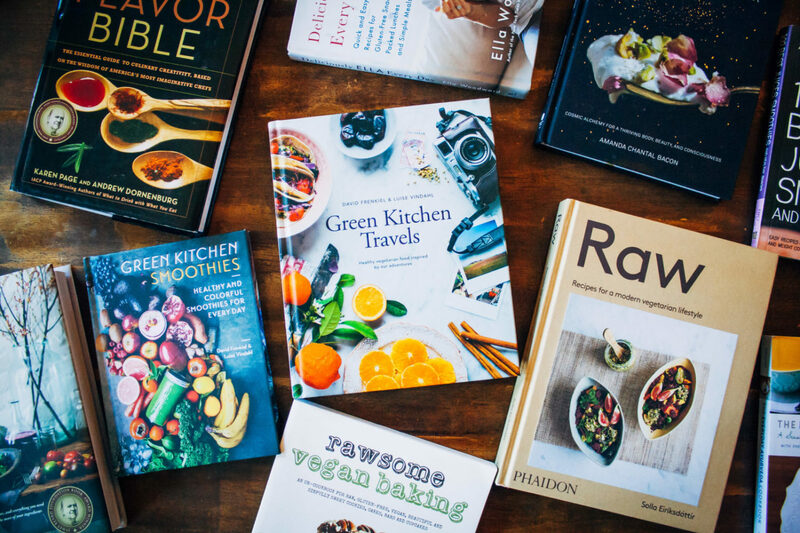 Words like plant based, vegetarian, vegan, detox, paleo… but as bloggers, I guess it’s important to point out what our point is whether in a title, summary or about section. I just want to eat good food (and this is defined broadly, I realize, each having their own definition), and a variety of it with balance left in for indulgences and sweets. I love so much about this gorgeous salad, especially since I saw jalapeños! And brown rice is one of my favorite bases for salad… short grain even better! Delicious work Sarah! Absolutely no mention of how much kale…?! Absolutely delicious! My mom and I are vegan but I often cook for my whole family which splits us 50/50, vegan/non-vegan. Was really craving some greens for dinner and had saved this recipe so finally tried it! I don’t often use kale as the basis for a salad, but I have a feeling I will now! The combo of the warm roasted veggies with the kale really made a warm, hearty meal. The only change I made was making an avocado/spinach pesto because I’d been wanting to do that anyway, and didn’t get carrots with the leafy bit still on. The dressing I made worked well and was very creamy, next time I will have to find carrots with the leaves so I can try your pesto! Thanks for this lovely dish, we all loved it! It looks like there is some kind of pepper in your salad? Are those jalapenos? This looks amazing! Good eye, they are jalapenos! :) Thanks Emma! Sarah, you did an awesome job with this recipe! This dish is super alkaline! Sarah, I made this for my family and it was a hit!!! All the ingredients with the pesto paired well together. This will be a regular meal for us. Thanks! Amazing! We love this recipe and have just declared it as our new family staple! My boyfriend — who avoided kale and carrots and potatoes — is love with it as much as I am! That is HUGE, trust me. It’s a keeper — no edits needed — the jalapeños and sesame seeds add a nice touch. Keep up the good work, Well and Full! While it sounds good… I’m having a hard time wanting to eat this during the WINTER – with cold salads. How about warming this up instead? Would that work? If you serve the salad with the rice freshly cooked and vegetables out of the oven, the salad will naturally be warm! In any case, feel free to pop it in the microwave for 30-45 seconds! I totally hear you, I’m not a fan of cold salads in the winter either ;) Let me know how it goes! I made this last night and not only was it easy to make – it was so good. My meat-loving husband said “this is a keeper!” Thanks for this recipe. I made just enough for leftovers for my lunch today – my co-workers all had lunch jealousy – I had to share the recipe with them too. I made this last night & it was awesome! I added broccoli to the sheet of vegetables & it was very yummy. Definitely will add this to my favorite recipes & make more often. The carrot pesto was so good & something I’ve never made before. Do you know if this will this still work without Olive Oil, or is there a low fat substitute? I’ve made this 3-4 times and I absolutely LOVE IT!! I didn’t have carrot tops so I used a mixture of spinach and fresh basil. This recipe is DIVINE, I can’t recommend it enough! I’ve shared it with several friends all to rave reviews as well! I made this dish tonight and it was so delicious! I made a few substitutions as I unfortunately waited too long and my purple carrots went bad so I used regular carrots and I used sweet potatoes as I usually don’t eat regular potatoes; however, the spices went perfectly with the vegetables! I also put a dallop of hummus on top as I can never get enough! Thank you for the recipe! Hi Jessica, I’m so glad you liked the recipe!! This definitely sounds like it would be delicious with hummus ;) Thanks so much for leaving a note!! Whoa! That was amazing. Sharing with all my friends! We added cayenne and garlic to the carrot pesto for a little extra zing! Thank you, Thank you! I’m so glad you liked the recipe, Kaylee!! Garlic and cayenne sound like awesome additions :) Cheers! I meal prepped this for a week and its delicious. Just wondering if you knew how many calories is in this? Hi Jade! Thanks for writing :) I don’t have the calorie count for this recipe, but MyFitnessPal has a great recipe calculator you can use! Chef here in Portland Oregon! ❤️ Made this for a client yesterday and the salad was gorgeous and delicious. Only substitution was more lemon juice and zest and a few basil leaves in the pesto. I’d never tried using carrot tops for pesto…genius and tasty! Thanks for a deeply satisfying, healthy recipe. You currently have changed my life with your blog. I think I have made at least 4 recipes from your site this week, and my entire family and we have loved them all. I got a store bought vegan pesto due a lack of carrot tops and a silly, keepin-me-busy 2 year old! I absolutely adored this. THANK YOU. I am grateful I found you. My favorite vegan/food blog so far. This salad is everything!! I have already made it a couple of times and look forward to trying a host of seasonal variations. I did add some chopped tempeh bacon + lemon zest, and it was heaven in a bowl. It’s also great for lunch the next day. Many thanks for the inspiration as I am learning to have more love for salads as a main. Did you peel your carrots? Not for this recipe, no! You can go either way, depending on how the carrots look :) The carrots I had were in really good shape, so I just washed them really well and they didn’t need to be peeled! Hi Sarah, I just came across this recipe and it looks amazing! I am however trying to watch my diet by keeping a track of calories I take in daily. Are you able to provide the nutritional information for this meal at all? Hi Diana, thanks so much for writing! I use this recipe calculator from MyFitnessPal :) Hope this helps! This has got to me one of the best meatless meals I’ve had! 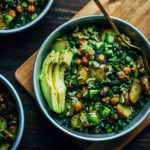 When my husband wanted to go more meatless I was a little disappointed…however, this meal is incredible! I did not have carrot tops so I opted to just use regular basil pesto (I mixed the pesto in the kale and also on the rice). I also added sweet potatoes and brussels sprouts to the cooked veggie mix. My husband was RAVING over this meal. This is definitely a keeper! Hi Aspen, I’m so thrilled to hear you and your husband liked the recipe!! Sweet potatoes and brussels sprouts sound like great additions to this salad :) Thank you so much for leaving a note! 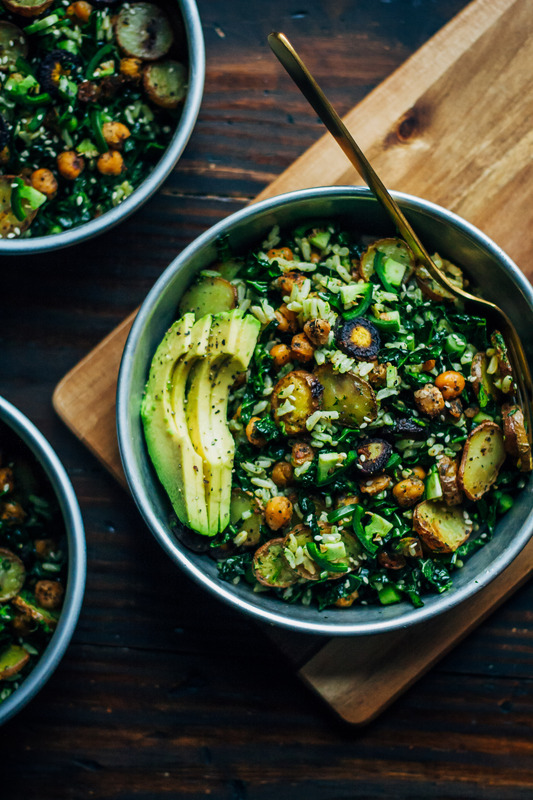 I’m doing Whole30 and want to make this salad, but omit potatoes and chickpeas. I am thinking of subbing roasted butternut squash and brussel spouts. How do you think that will work out? I’ve never cooked carrot tops, didn’t know you could! Do I use the entire top from the carrot up? It’s an absolutely stunning salad and can’t wait to try it. Love the combination of this salad! Especially the jalapeño! Delicious! Instead of the pesto, I drizzled balsamic vinaigrette on it. Healthy and delicious! Hi Tracey, I’m so glad to hear you liked the salad! Balsamic vinaigrette sounds like a delicious addition. Thanks so much for leaving a note! Very well done Sarah and thank you so much for sharing!! This collection of textures and flavours is unexpected and amazing (of course anything with roasted chickpeas has my heart). Highly recommend everyone try this recipe!